This short (about 140 pages) graphic novel was created by the same Canadian cousin team that gave us This One Summer. In fact this graphic novel was their first. 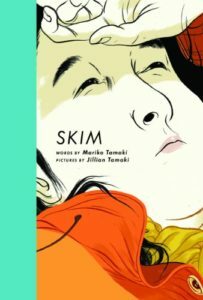 Nominated for an Eisner (among other awards), Skim is the story of Kim (aka Skim), a Japanese Canadian teen who is struggling with a variety of issues, including matters related to sexuality, depression and suicide. The story is told in three parts. Part I: Fall, takes place in fall but is also about falling. Kim serves as our narrator via her diary, and through her entries we learn about her relationships and her dreams. Kim’s parents are divorced and she lives with her mother and cat. Kim is deeply interested in Wicca, as is her friend Lisa, but Kim’s interest seems sincere, Lisa’s more superficial. Lisa can be snarky and downright mean sometimes, and this is especially evident when one of the popular girls, Katie, is dumped by her boyfriend who later commits suicide. Through her diary, Kim reveals things she would never say to Lisa, like that she thinks Lisa is an idiot sometimes. And Lisa can be really mean to Kim. The fact that she calls Kim “Skim” is a sign of this. Skim is the nickname others gave her due to her size (she is not skim). After Katie’s boyfriend dies, counselors are deployed at the school to help students with their grief and to identify those at risk for depression and suicide. Kim, due to her Goth appearance and quiet demeanor, is generally considered an at-risk student, which she finds puzzling. John Reddear, the boy who died, was popular, athletic and seemingly happy, but he was apparently depressed and suicidal. Kim wonders, “How come all the girls on the soccer team aren’t in counseling?” Meanwhile, Kim occasionally skips class to smoke in the woods outside school, and there she encounters her English teacher Ms. Archer. As they meet secretively to smoke and talk, Kim falls in love. In Part II: No Rest for the Wicked, Kim’s relationships deteriorate and she becomes more and more depressed. Meanwhile, Katie has fallen off the roof of her house and been injured. The popular girls start the Girls Celebrate Life club, which seems to be a vehicle for their own self importance and gratification rather than for genuinely helping others. The fact that they have always and continue to treat Kim like garbage is proof of this. Kim’s entries show the reader her growing alienation and despair as well as her feelings of isolation. Her belief in and practice of Wicca provide no help or solace. In Part III: Goodby (Hello), Kim and the reader learn more about Katie, who is not the person we might have thought from Part I, and Kim will begin to come to terms with some of the issues she has been wrestling. This sounds amazing. I’m so glad you reviewed it. Thank you. I had heard of this novel a while ago and kept meaning to pick it up. Canada Day was the push I needed!